A singer-songwriter and member of the Cree First Nation, Jason’s been singing blues and soul and playing lap slide guitar for more than 20 years. After graduating from Douglas nearly a decade ago, he spent five years working as youth coordinator for Vancouver Aboriginal Transformative Justice Services. Four years ago, he quit his job to do music full time. It was the best decision he ever made. He’s won his share of accolades, too. Last year he took home the Aboriginal Peoples Choice Music Award for Best Album Cover Design, for Where the Blood Mixes. 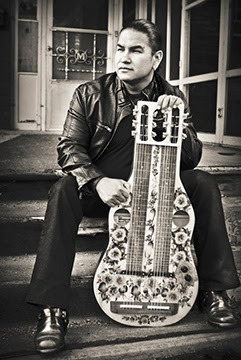 In 2009 he was nominated for a Jessie Richardson Theatre Award, was nominated for a Juno in 2007 and won a Canadian Aboriginal Music Award for Best Instrumental Album in 2005. For those budding musicians out there who are thinking of making the leap from 9-5 to living the dream, Jason has a few words of wisdom. And, of course, the old adage – but one that rings true: Believe in yourself. Find out more about Jason on his Facebook page.